Sleepwalk with Me is a wonderful, relatable film that is based off the life of co-writer and co-director and star Mike Birbiglia, and adapted from the one-man-show of the same name. Matt Pandamiglio (Birbiglia), is a struggling comedian, stuck behind a bar serving drinks at a New York City comedy club. His long-time girlfriend Abby (Lauren Ambrose), is supportive, but frustrated with Matt’s unwillingness to move their relationship forward. Given the opportunity to get on stage to tell a few jokes, Matt struggles for a laugh from the audience. Matt also begins having sleepwalking episodes that grow increasingly dangerous, starting as kicking a hamper he thinks to be a jackal, and jumping off a table. A chance encounter gets him booked at a comedy club in upstate New York, where he stumbles upon new material, expressing his fears about marriage and commitment to big laughs. So begins Matt’s journey, touring thousands of miles at a time, using his own life and problems as his material. 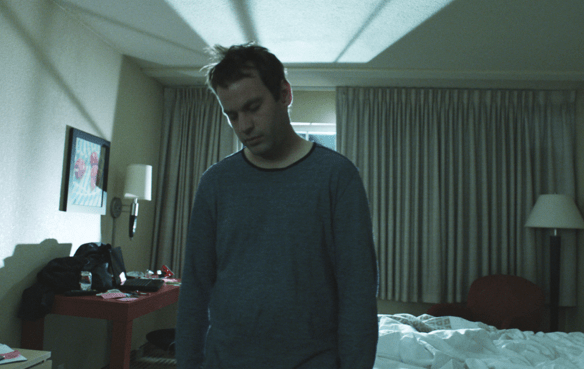 Sleepwalk with Me is no doubt an extremely personal film for Birbiglia, as autobiographical as you can get. It is universal in that almost everyone can relate to the same fears as the main protagonist. We’ve all been in relationships like Matt’s, nothing exactly wrong with it, but staying in it as to not hurt the other person. Matt finds what’s missing by recognizing what’s wrong, and the transformation is classic story telling. The sleepwalk sequences are amazingly hilarious, not overly surreal like most dream sequences, but you occasionally may not know he’s in a dream when he is – which proves to be quite hilarious and satisfying. The entire film is told from Matt’s perspective, at some points, he’s looking right at the camera taking us through the events. The use of this mechanic reminded me a lot of High Fidelity, though one relationship instead of five. While, not the best looking film I’ve seen, the story found within is just so fresh, funny, and relatable, that it was a total non-issue for me. The performances are wonderful to watch, and Matt’s jokes, even his earlier (non-funny) stuff is a riot, so bad its good. It really is amazing watching his transformation. Sleepwalk with Me is a great film, one that I can see enjoyed by all. The film will be have a limited release, August 24, 2012 – I highly recommend to seek this film out, you’ll be in for a great time. Click for an excerpt from the Q&A following the screening at IFFBoston.